A Rs 240 crore budget deficit, no money to pay salaries, hand-to-mouth on bare essentials — The Indian Express tells the story of a proud institution’s crippling cash crunch, which burst forth in an unprecedented explosion of student frustration on campus this week. 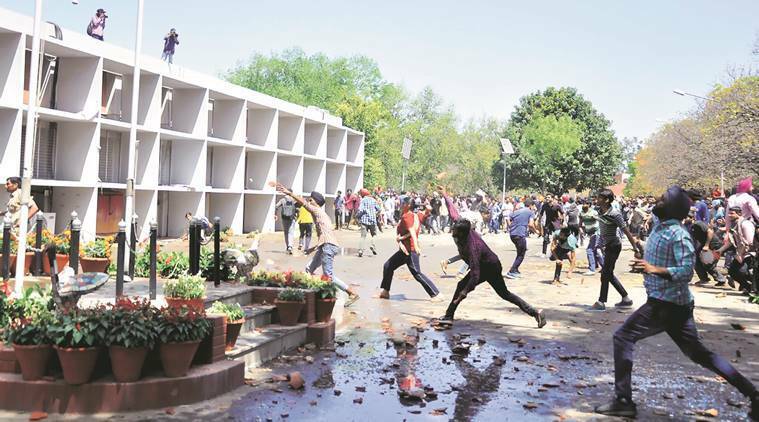 On Tuesday, students of Panjab University fought pitched battles with police on campus, leaving 22 policemen injured, and provoking police to temporarily slap the extraordinary charge of sedition on 66 protesters. The violent protests, directed against a large increase in tuition fees, marked a dramatic escalation of tensions in PU, roiled for 2 years now by an acute shortage of funds that has triggered student and faculty unrest and brought the university to its knees. How did PU, which was ranked in the 226-250 band — the highest for an Indian institution, ahead of the IITs and IIMs — in the Times Higher Education (THE) World University Rankings for 2013-14, come to this pass? Since when has PU been short of funds, and facing difficulty in functioning? In April 2015, the Akhil Bharatiya Vidyarthi Parishad (ABVP), the BJP’s student wing, complained to the Home Ministry about alleged misappropriation of PU hostel funds, following which the University Grants Commission (UGC) set up a fact-finding committee, and central funding for the university was frozen. Subsequently, PU held back retirement benefits of former employees and, that August, the Board of Finance declared it would soon be difficult to pay salaries. Over time, PU faced challenges in meeting essential day-to-day expenses. It could barely scrape through with paying power, water and minor maintenance bills. In July 2016, Vice-Chancellor Professor Arun Kumar Grover said there was no money to pay salaries — funds were subsequently diverted from other budget heads. In September 2016, during a meeting of the university Senate, the VC said that if the Centre did not provide funds, PU would shut down by January 1, 2017. The Punjab and Haryana High Court took suo motu notice of the VC’s statements and, in January, ordered the UGC to release a grant of Rs 30 crore within four weeks. When this was not done, PU failed to pay salaries for February to its staff, and approached the High Court seeking contempt proceedings against UGC. Okay, so where does PU get its revenues? After the reorganisation of Punjab in 1966, the university was declared an “inter-state body corporate”. Until the 1970s, Punjab, Haryana and Himachal Pradesh contributed funds, after which Haryana and Himachal withdrew. The ratio of funding between the Centre and Punjab was fixed at 60:40, with the Centre’s share being released by the Home Ministry. The UGC has fixed the Centre’s share at Rs 176 crore; however, the Punjab government, instead of paying its 40%, has put an annual ceiling of Rs 20 crore on its contribution. PU, whose other source of revenue is fees collected from students, has asked the state government for more money. PU’s approved budget for 2017-18 is Rs 515.61 crore. Its total estimated income from all sources is Rs 271.33 crore and, the estimated deficit, Rs 244.29 crore. The estimated deficit this year is more than that of 2016-17 (Rs 217.73 crore). The expenditure on the salary and retirement account is estimated to be Rs 424.64 crore this year, and that under the non-salary head, Rs 90.96 crore. When did the university raise fees? When was the last time it had done so? In September 2015, PU constituted a Think Tank headed by Vice-Chancellor Grover and comprising members of the university Senate, to discuss solutions to the financial crisis. PU authorities contended that the UGC wanted the university to generate more revenues in order to attract higher grants. Among measures suggested to increase revenues was enhancing tuition and examination fees. The Think Tank also mooted proposals such as leasing out buildings and renting out rooftops to put up solar power panels. None of these other proposals has been implemented until now. In July 2016, PU raised examination fees by between Rs 500 and Rs 8,000 for various courses. During a meeting of the PU Senate in March this year, a decision was taken to raise tuition fees by 40% to 1,000%. This was the first time in 6 years that PU had increased tuition fees, and the blow, as a result, has appeared even harder. With the higher fees, students at PU will pay Rs 10,000 annually for all MA courses. This is more than at Punjabi University, Patiala (Rs 3,600) and Guru Nanak Dev University, Amritsar (Rs 4,600), but less than Himachal Pradesh University (Rs 25,000). The annual fees for the MSc (General) course at PU will be Rs 15,000, whereas it is Rs 5,220, Rs 17,000, and Rs 75,000 respectively at the other three universities. What has been the impact of the funds crunch and agitation on teaching and research at PU? The mood on campus has been angry and distracted. In the union HRD Ministry’s National Institute Ranking Framework (NIFR), PU has fallen from rank 12 last year to rank 33 in the latest rankings released recently. In the Times Higher Education Rankings for 2013-14, PU had been placed in the 226-250 bracket, the highest for any university in the country. In the subsequent year, PU slipped to the 276-300 bracket along with the Indian Institute of Science, Bengaluru. In both years, PU was ranked ahead of the IITs. In 2014, PU took the No. 32 position in the Asian University rankings, and topped India. The good showings were due primarily to PU’s research citings. So, where does this situation go from here? PU has objected to UGC’s fixing of its grant at Rs 176 crore, saying several other universities and colleges had had their grants raised by up to 15%. Last month, Chandigarh MP Kirron Kher met HRD Minister Prakash Javadekar, following which the Centre agreed to release a “one-time grant” of Rs 140 crore for PU. The university has not, however, received any official communication to this effect yet.